I am playing along with Bug and Pop's lovely "Eye Spy" each Sunday. This week's theme is from the gorgeous Aussie Waffler. She has asked us to spy a bit of joy. This is something that brings joy to Argy and Bargy on sunny days. 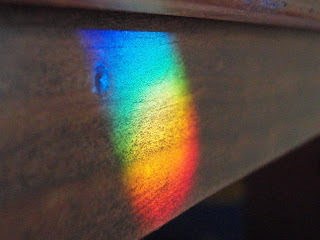 Our loungeroom shimmers with "rainbows" cast from crystals I have hanging in the window. The boys love to chase the dancing colours about as the sun changes position through out the day. They never tire of their rainbows. Poor Mr HB always looks uncomfortable about the whole rainbow thing. Being the boffin he is, he sometimes attempts to correct the boys. Blah blah ... refractive index ... blah blah ... water versus crystals ... blah blah ... Snell's Law ... blah blah ... not a true rainbow. Rainbow or not, I have to say its hard not to smile when I see the myriad of beautiful, intense colours. And just quietly the thought of explain physics to a 3 and 4 year old also makes me smile. Thank you to Cindy for hosting Eye Spy and to Tara for the theme. To discover other adventures, head over here. Poor Mr. HB - I also have someone close to me that would try explaining the difference!! !